Melt caramel in microwave on 50% power, 30 seconds at a time until melted. Alternatively, you could melt caramel in a pan on low-medium heat. Add a tablespoon of butter, adding caramel once the butter has melted, and cooking until caramel melts. Dip half of one side of the apple slice into the caramel. Do not dip both sides into the caramel, as that will prevent it from becoming crispy. Place non-caramel dipped side on a baking sheet lined with parchment paper. After 1 hour of baking, check on your apple slices. Remove once the apples begin to brown. After taking out of the oven, sprinkle salt over the chips, allow to cool (they will become more crisp as they cool), then enjoy! I don't know about you guys, but I'm running out of space trying to store all the apples people keep giving me! It's a blessing and a curse. Up until now, I was having a heck of a time trying to figure out different ways to use the apples, but today that's all going to change. Behold the miracle that is Apple Chips! Seriously. Why have I never made these before? They are freakin' delicious! 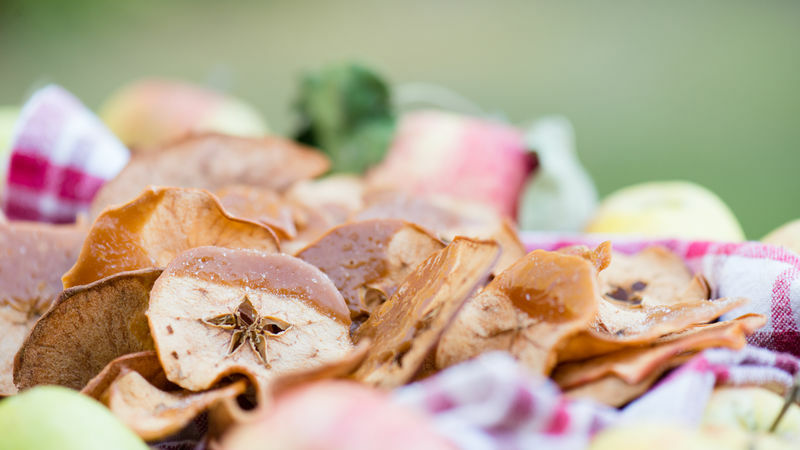 Of course, why would you want to be all health conscious and low-cal with plain old apple chips when you could have Salted Caramel Apple Chips Spoil yourself and dip those babies in caramel, sprinkle on a little salt and you are on your way to some seriously addictive and delicious snacking! I've experimented with a few different ways of cooking them and found it's best to cook them on parchment paper so they don't stick to your pan and you don't have to flip them. They also cook really well on a pizza stone, not to mention a lot quicker (about an hour versus two). Slice your apples really thin with a mandoline or a sharp knife. The key to baking the perfect apple chip is making sure each slice is roughly the same thickness, allowing them to bake evenly. These are super simple and very very addictive. Trust me, I ate them all!